KATHMANDU, July 10: Considering the serious challenge of vetting of security personnel, stakeholders have initiated a process of sorting out the problems and reviewing and systematizing the existing vetting module. The categorizing of security personnel as “being under vetting” by the UN, other international agencies and Western embassies had been increasing of late, posing serious problems for the security personnel. Inspector General Upendra Kanta Aryal, AIG Bigyan Raj Sharma and DIG Bijaya Lal Kayastha, among others, from Nepal Police; Attorney General Hari Phuyal and two deputies from the Office of the Attorney General, and representatives from the US embassy, including Resident Legal Advisor Russell L Carlberg, and Lt Colonel Joe Evans of US Army, both based in Nepal, held talks on various aspects of vetting security personnel, at a hotel in Lalitpur. “We shared our concerns related to vetting and both the parties vowed to sort out the issues jointly with adequate homework within the institutions,” AIG Bigyan Raj Sharma said. 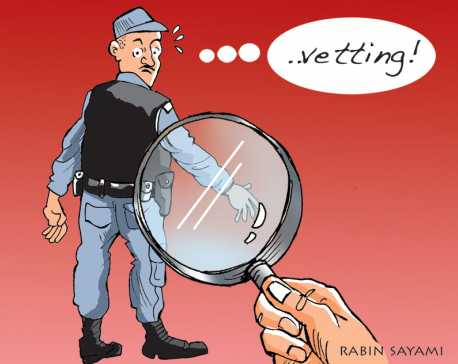 During the meeting, Nepal Police officials questioned the credibility of recommendations made by some NGOs based in Nepal for vetting security personnel, the ethical grounds of doing so and access over the right to information on the cause of vetting. According to police sources, the US embassy officials highlighted their positions on vetting and assured on reporting to their higher authorities. Officials from the Nepal Police and the Office of the Attorney General were briefed that every year around 15,000 personnel from across the globe were kept under vetting category by their government on the charge of serious human rights violation. In return, Nepal Police tried to convince that a body within the Nepal Police investigates serious human rights violations and recommends to the government the actions to be taken against the violators. Meanwhile, Nepal Police also pledged to investigate the individuals kept under vetting category and consult with related experts and government bodies to sort out the long-pending problem. US embassy officials also cited the need of civilians’ participation while probing personnel under vetting category. National Human Right Commission (NHRC) periodically recommends the government to take action against those involved in human rights violations. Those recommendations were not referred by the international agencies and western embassies based in Nepal “vetted security personnel” based on the reports of some local and other NGOs, according to officials. The police argued that NGOs were guided by their own vested interests. Similarly, Nepal Army spokesman Tara Bahadur Karki said the NA had written to the embassies and other international agencies about its concerns regarding the vetting of its personnel. And the respective agencies, including the US embassy, have assured them of reporting to higher authorities and holding talks with the respective departments of the NA soon. Officials at the security agencies also blamed the lack of clear policy and initiatives from government in identifying the perpetrators of human rights violation and responding to the international agencies with concrete government findings. Twenty-four different police units, including district police offices and crime investigation divisions, and a few of NA barracks have also been blacklisted by the international agencies.